Today I have Manuel Becvar on the show. Now Manuel and I had exchanged several emails in the past few years but it wasn’t until Will Tjernlund and Peter Zapf of Global Sources and I started chatting did I get to know Manuel. If you’ve never heard of Manuel, he runs ImportDojo.com which is a site that helps others source goods from Asia. In fact, Manuel runs a sourcing service as well and he has been helping me source a few things from China. Anyway, Manuel has a ton of experience sourcing products from Asia and he’s got a ton of contacts as well. How to get the attention of a supplier to let them know you’re serious. How to attract quality suppliers. Steve: You are listening to the My Wife Quit her Job Podcast. If you are new here, it’s a show where I bring in successful bootstrapped business owners to teach us what strategies are working and what strategies are not. Now I don’t bring on these famous entrepreneurs to simply celebrate their success, instead I have them take us back to the beginning and delve deeply into the exact strategies they used early on to gain traction for their businesses. Now if you enjoy this podcast please leave me a review on iTunes, and if you want to learn how to start your own online business be sure to sign up for my free 6-day mini course, where I show you how my wife and I managed to make over 100K in profit in our first year of business. Go to mywifequiteherjob.com, sign up right there on the front page, and I’ll send you the mini course right away via email. Now onto the show. Steve: Welcome to the My Wife Quit Her Job podcast. Today I’m really excited to have Manuel Becvar on the show. Now Manuel and I exchanged several emails in the past, but it actually wasn’t until Will Chanlin and Peter Zapf of Global Sources and I started chatting did I start getting to know Manuel better. For all of you who have never heard of Manuel, he runs ImportDojo.com, which is a site that helps others source goods from Asia. In fact Manuel runs a sourcing service as well, and he’s actually been helping me source a couple of things from China. I’ll probably write about the experience as soon as I have some product in hand to talk about. 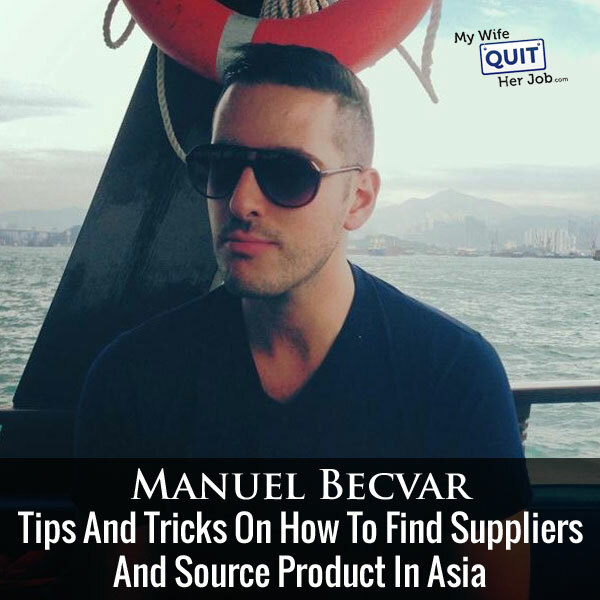 Anyway Manuel has a ton of experience sourcing products from Asia, and he’s got a ton of contacts as well. His blog at ImportDojo.com is also an excellent resource that you should check out as well. With that, welcome to the show Manuel. How are you doing today man? Manuel: Hey Steve, doing great. Thanks for having me on the show. I’m really excited. Steve: We’ve been chatting for a little bit. I never got the whole back story. How did you get started in ecommerce, and what was the back story behind Import Dojo? Manuel: It goes a long way I guess. Originally I’m from Austria. I moved to Hong Kong in was late 2005 when I was asked by a big DIY retail in Austria to take care of some of the import products in their sourcing office in Hong Kong. I moved to Hong Kong in 2005, and I’ve been working for this retailer and sourcing office for a while. Then I changed jobs and essentially I ended up going back to that same company again in 2011. I was there until 2014. From 2005 to 2014 I was in several different positions in different companies mainly sourcing, going to China, accompanying buyers to factories, going to the exhibitions, negotiating prices, the whole package as a product manager based in Hong Kong. Steve: What type of products were you sourcing for those companies? Manuel: Mainly electronics actually. A couple of household products, but I think I’d say my expertise really lies in electronics, consumer electronics, household electronics, lighting, solar items, pretty much everything would apply. Beginning of 2014 I always wanted to have my own company, but never really figured out the right idea. Then in 2014 I just started to contact a couple of my customers. They were really interested in my idea which was mainly purchasing products from China, consumer electronics, but modify them, improve them, put my own private label on them, have a nice packaging. In 2014 I started Mandarin Gear which is still my consumer electronics brand. I started out offering to my existing and older customers. I started to realize that most of the people don’t really have any idea how to import from China, and all the regulations, the processes that come along with it. In late 2014 I also got into Amazon a little bit, but not that much. I started to write up a little guide on importing which quickly turned into a 65 pages eBook called the Import Bible. I think people can download it on my site for free. I realized people want to know more. Not just the basic process, but also in-depth knowledge on sourcing from China, how to deliver to Amazon and the whole package. I created Import Dojo in early 2015 which was in the beginning just really a blog, and then where you can download my free eBook. I wrote three more books, and then made this into an online course with over 100 video tutorials right now. On the side I started offering sourcing for mainly Amazon sellers who are not comfortable working with Chinese suppliers, or who like the experience or just want someone professional to handle the entire thing. All the while I also focused on my own Amazon business, and that’s what I’m doing today. Steve: Can we talk about Mandarin Gear a little bit. What does that sell? Manuel: Mandarin Gear sells Bluetooth speakers, smart phone accessories, but also have a French press of house hold product into it. They’ll be 3 new products under the brand coming up, but Mandarin Gear I mostly sell to retailers in Europe, the retail, not ecommerce. Steve: I see, so you’re wholesaler. Manuel: Exactly. I improve the product. Let’s say a Bluetooth speaker, I see it at the factory, I like to design, but for example the sound output is not good, or the finishing is not good. What I essentially did is I changed some of the components inside, made the sound better, changed the finishing let’s say from cheap plastic looking to rubber coating, and a nice packaging instruction manual and all that. Then put my label on top and offer it to buyers in Europe together with customer sales follow up and customer service. Steve: How did you find your customers for that business? Manuel: Mainly those were all contacts that I gathered in the 10 years that I was working as an employee in Hong Kong. Manuel: I was working as a sales person at some point, but also as the product manager for the retailer. I’ve collected a lot of contacts in the industry. Steve: How does that differ from selling to the consumer like on Amazon versus being a wholesaler? Would you say that it’s easier? It’s harder? Okay. Manuel: Oh no. It’s a lot more difficult, and it takes a long time. For some of my products I’m working on a customer for over a year now. They have long processes especially the big companies. There’re so many hierarchies and so many decisions, different decision makers. People quit their jobs. You need to talk to a new decision maker. The product goes through a long testing period. They need a lot of different samples. They want improvements done. It’s complicated, but let’s say if you have a large retailer, and you’ve been working on that retailer for a long time and they do place an order, the benefits are good, are great because in one go you can sell 10,000, 20,000, 30,000 units of a product. Even if you only make a dollar profit on it, that’s $30,000 in your pocket in one day. Steve: Right, and they’ll probably buy consistently from you too, right? Manuel: Exactly. It’s about the reorders from those retailers. They will not just place reorders for the existing items. Once you have created a trustworthy relationship, they’ll also be interested in sourcing other products from you. You extend your assortment with them in a way. It has its up and downs, but it’s a lot more difficult to deal with retails than selling yourself on Amazon or ecommerce. Steve: Is that why you’ve transitioned over to Amazon? Manuel: Yes. One reason is because it’s easier. It’s not easy but it’s easier. Also retail slowing down a lot, ecommerce is hurting the retail in Europe massively. I’ve got all my retailers complaining, “Look, we need better prices. Amazon.de or UK, the prices are a lot lower.” Customers can have it within 2 days from the comforts of their homes. Less and less people go actually into shops unless it’s a textile product or shoes or clothing. They still go to the store for that, but simple products, consumers are really shifting to ecommerce in Europe, and that’s hurting the retailers a lot. Steve: Interesting. Do you sell the same products to your retailers? Do you sell the same items on Amazon? Manuel: No. The ones I sell to the retailers are not available on Amazon. Steve: I see. I was going to ask if you’re competing against your own customers. Steve: Let’s talk a little bit about your fall away into Amazon. You have a sourcing company, and you obviously deal with a bunch of people, who you say don’t quite understand the sourcing process that well. What are some of the common mistakes that you’re seeing with some of the new people who are trying to source products from Asia? Manuel: I think the most common mistake is not to have any inspections. Just the other day I was talking in a Facebook group. Someone said can you ship directly to Amazon? And I said, “Yes. I’ve been doing it a long time.” And she asked me what are the pitfalls, and it should be okay if I asked the supplier to take a few photos and send to Amazon. And I’m like, no, I mean there are so many things that can go wrong during a production. The number one thing I tell people is always have an inspection, because even if you have a very good relationship with your sales contact at the factory, he’s not assembling the product. Also in the production line, there can be many mistakes and even if you– let’s say you give very clear directions what the packaging is to look like, or how many labels you need, I’ve seen it so many times. I think I never had any inspection that went pass on the first time. First of all, always have an inspection, second do a thorough background check on your supplier, not just trusting let’s say Alibaba goods supplier or background checked. You really need to look into each supplier’s in-depth, ask them for company registration certificates for different products. You need to ask who are his customers, which markets does he work for. When you get the feeling okay this guy is delivering for example products to the Middle East, and he’s never worked with a customer in the US, I mean it’s probably very difficult to handle my order for the US. So make sure you work with suppliers that really work in your market, that know your requirements and most of all that are interested in working with you. I mean if you are having troubles speaking to a supplier in the beginning and not getting answers to your questions, imagine how it would be when you actually later placed the order and tried to work with him. Find suppliers that are actually interested in your business. Steve: Let’s talk about the– sorry. Manuel: Just one last thing. Always get samples. Never place orders just through email, never having seen the actual product and probably get samples from different suppliers as well. I think those are let’s say three to four main pitfalls that people should look into. Steve: Let’s talk a little bit about the inspection process. Do you grab samples off the line as well as do an inspection at the very end? What is your procedure? Who do you use and how much does it cost? Manuel: Right now I use two different inspection companies. One is called chinaqualitycheck.com. It’s a very simple inspection service. I mean, they charge $100, but I only use them for like really simple products. Let’s say I have a big brush, or let’s say a silicon product that doesn’t need a lot of testing or handling in the production. And on the other hand I work with AsiaInspection. I think it’s other really popular right now. They charge $309. The prices that I mentioned here are for final shipping inspection. So that’s not an online inspection or drawing any samples. That’s just the inspection before shipment. I use them for like more complicated products, although I’ve used them for my recent products and the French press which is also the case study which required a bit more of looking into products. If I have an electronic product, I always use AsiaInspection. And in some cases I even use let’s say really reputable companies like TUB, Bureau Veritas or even Intertek in some cases, but they charge $400, 500 up. Steve: So do you do any online inspection as well, or just at the end before the delivery? Manuel: Sometimes. If I work with a supplier for a long term already, I do just the final inspection. But let’s say I have a complicated or difficult product, and I’m working with a supplier for the first time, I’ll probably also have an online inspection just to make sure everything is according to my requirements, and not that I show up on the last day of production with the final inspection, and I find out too many problems that can’t be reworked any more. So sometimes yes. If I work with a new factory, I also have online inspections. Steve: Has it ever happened to you where at the very end the entire batch was bad? Manuel: Not bad in a way that you couldn’t rework it anymore, but yes it happened quite a few times already. I mean mostly it’s labels missing or scratches on the product or dusty or whatever, but it also happened that– for example I got a completely different color manufactured, and I found that at the final inspection. That was too late. Steve: So what do you say to the manufacturer at that point? Manuel: Well, I do have contracts and purchase order agreements in place. So whenever I place an order, I tell him right away, these are my requirements. I will do an inspection, I pay for it. If there is anything wrong, and I find out during the inspection, we have to do a re-inspection and he has to rework the goods until they are what I ordered. If he doesn’t do that, he doesn’t get the rest of his money. Yeah, that’s pretty much. Steve: I’m just wondering if any relationships that you had have been strained as a result of an inspection at the very end not turning out how you want, and then the manufacturer actually not making any money on the deal, because what they did was not up to your specifications. Manuel: It happens. I had a product recently that didn’t go so well in the production, and in the end we had to rework twice and the supplier was not really willing to do any rework, but there’s nothing you could do. I mean he’s still waiting for his money and eventually we shipped the product and everything was okay. But I mean he’s not happy. Obviously he wants me to reorder or he wants me to place new order so that he can make up the loss. For me, it really depends. If the supplier is like, “Okay, we realize the problem, we apologize, we’ll rework it, it’s all on our cost,” I may go ahead with the supplier in the future. But if he’s like really unwilling to help, and if he screws up the order entirely then yeah, I’ll just try to get the product shipped out, see that it’s okay. Well, if it really sells well, I’ll probably look for a supplier parallel. Yeah, I might not work with him again. Steve: How do you find your suppliers? Manuel: I have the advantage of being here for 11 years and every year I go to I’d say 20 to 25 exhibitions. So I’ve made a lot of contacts in the past. That’s why we also– I think I mentioned that before, we have a sourcing company. We have a database of over 1500 suppliers. We’ve collected a lot of context in the past. But for all of your listeners out there, I think the safest or best way to go is alibaba.com or globalsources.com where you can find most of your products. I do go on through there sometimes especially if I look for new products, and we don’t have a supplier for it yet. You go through the background check, the vetting process with those suppliers. It’s the same as with my existing suppliers, I still do background check with them, because maybe management has changed, or they’ve changed the location or the production line has increased or decreased even. Steve: Can we talk about your background check process? What do you do? And if I see in the first reply that he doesn’t reply my questions, I know that he is not serious and I won’t move forward with him anyway. But if he’s serious, I will ask him for, I want to see his company registration. I will send him an exo [ph] file, I call it my vendor profile where he has to fill in certain things like how much turnover does he have, where is his factory located? Who are his customers? Which markets does he work with? Does he have certifications, like for example, FTA, or MCC for electronic products? I want to see a couple of those, let’s say softcopies of the PDF reports. I want to see them. I want to actually see the certificate is issued in his name, and the certificate is not 25 years old. I want him to be proactive and deliver all those things to me, and if I feel he does that and he over delivers maybe, I feel comfortable working with him. Steve: That’s interesting. You start out with those questions like right on the first interaction. Manuel: Yes mostly. I mean, if I’m– let’s say I’m serious about a product that I really want to develop, then my first email will be very detailed to the supplier with a lot of questions. Steve: I see. Can you comment a little bit about Alibaba versus Global Sources? Manuel: I like both. Not sure I’m allowed to say who I prefer. Steve: Yeah let’s not do that. Manuel: I think we both know Peter from Global Sources is doing an excellent job on helping the community, but having said that Alibaba is great to find everything. You find really pretty much anything on Alibaba. It’s actually not been out there as long as Global Sources. Global Sources has longer background, but you may not find everything on Global Sources than you find on Alibaba. Alibaba has good filters to actually find and search the supplies and products that you need. Global Sources on the other hand also has different background checks for example they do an actual credit check with the factory. They actually sometimes go to their office and check if they really operate in that specific location. For example I exhibited as a supplier of myself with Mandarin Gear last year in April at the Global Sources show. To get there you have to actually have to be listed on Global Sources, and I had to go through a 3 stage verification process. They actually checked with me as a supplier, who I’m I, where is my business registration, what is my business turnover and so and so. I have gone through it personally, and I can say they are very professional on checking the suppliers. Since I’m not on Alibaba I can’t say much about that, but one thing Alibaba is really quoted is the mass of products that you can find there. There is good suppliers on Alibaba and on Global Sources as well. Steve: When would you use one over the other? Manuel: If it’s a really special product, I’d probably only find it on Alibaba. If it’s a really common product, but I need to find a very good supplier, maybe even a bit more pricey, then I would probably go on to Global sources. Steve: Reading between the lines it seems like Global Sources, the quality of the vendors tend to be better than Alibaba, because they do more vetting. Whereas it sounds like Alibaba has a much wider breadth of product options as opposed to Global Sources for that reason. Manuel: I think that is correct, absolutely yes. Steve: Have you ever used Panjiva or ImportGenius before? Manuel: No I haven’t, actually I have never used them. I know that ImportGenius, I think you find suppliers based on records, is that correct? Steve: Just curious and I have a bunch of students in my class, and I’m just what is your procedure for doing this is. How do you negotiate minimum order quantities in the beginning for some of those people who might not have as much money to invest in upfront shipment of products? Manuel: What you have to consider is that most Amazon sellers including myself, we are actually small fish for most factories. Retailers place orders of 10000, 20000, 30000 pieces up. When you come to a supplier and you say, “Okay I want the color box packaging, I want labels on it, I want engraving or logo on my product, and I want 300 pieces.” They are going to laugh at you. What you need to consider is that it takes a factory a lot of work and effort to actually produce let’s say 500 pieces. It can be done within an hour or so, but to set up the production line just for this very small client, and disturb the regular production line for the large client. It’s a lot of effort for the factory. Some of them are unwilling to do smaller quantities. Another thing that you can do is if the supplier tells me, “Sorry we can’t do less than a 1000 pieces.” I say, “Okay how about if I pay you 30 cents more and you do 500 pieces?” Surprisingly more suppliers are willing to do that. No one dares to ask because everyone wants to have cheap, cheap. They may move on to a large supplier who does smaller quantities. I’d rather go with bigger suppliers who have a proper production set up, proper factory facilities, maybe a pay little bit more than the competition. You don’t ask for white box that usually brings down the MOQ by half. Appeals to his business sense and ask for corporation. Steve: Are there any things that you do to be more attractive to a potential supplier? You mentioned this document that you send out. What does that document contain? It’s just an intro of you and your company? Manuel: Yes, that’s actually a good point. That actually shows professionalism. That’s a good way to convince a supplier for smaller MOQs. It’s basically a PDF that I’ve created 2 years ago. Its 10 pages, basically an introduction about me and my company, what is my general turnover, which markets do I sell to. Steve: If you are someone brand new, what would you suggest? Manuel: I’d say take an hour, create a small PowerPoint, or at least put some wordings together on who you are when you introduce yourself to the supplier, look professional. A lot of times since I’m also a supplier as Mandarin Gear, I get emails from potential customers and they are like, “Hi there, saw your product, please quote price.” I’m like, “Who are you? I want to do business with you, but please introduce yourself, show me that it is worth my time to actually spend time on preparing offers for you.” It takes a lot of time to prepare professional offers. I think you refuse those guys, I see it a lot with Amazon sellers who are just new that it’s not about being polite, but it’s about being professional. Show that you are a serious buyer that you want to do business in China. Steve: I just want to take a moment to thank Bench Accounting for being a sponsor of the show. Now I love running my ecommerce store, but you know what I hate doing the most? Book keeping, seriously keeping track of receipts, expenses, and especially inventory cost are easily the worse aspects of entrepreneurship hands down. Here is where Bench Accounting comes in. Bench is an online book keeping service that specializes in ecommerce businesses. They are experts at hailing all ecommerce related reports, whether it be from Amazon, Shopify, BigCommerce, Stripe you name it. All you got to do is sign up, and they will pair you with a team of dedicated book keepers who will handle everything for you. No more data entry, no more data crunching, no more headaches, plus its reasonably priced. 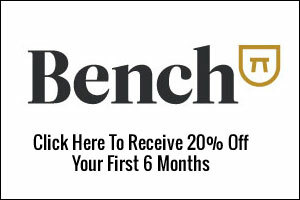 The best is that you get 20% off your first 6 months if you go to bench.co/mywifequitherjob. Once again that is bench.co/mywifequitherjob to get 20% off you first 6 months, now back to the show. Let’s flip the script a little bit since you run a wholesale company. What are some things that you look for when someone is contacting for the very first time? Steve: Yeah you are the supplier and someone else is approaching you. What makes a proposal stand out? Manuel: Well since I’m Caucasian, I’m Western; I have a different approach to business than most Chinese people. Most Chinese people will probably not do a thorough a research like me. When I get an email from Steve Chou mywifequitherjob.com, I probably look him up. I probably look at what he is doing, and how he is presenting himself on the internet, how he is presenting himself in the email, how he introduces himself. I want to know what business or what are the quantities I can do with this guy, pretty much what I said. Have a proper presentation about yourself, and have online presence. At least 1 or 2 pages with about me section, and what the business does. A lot of suppliers do that actually, they look people up online. They do, yes. Steve: They do? Let‘s switch gears a little bit and talk about one of your recent case studies that I saw on your blog where you sold $7000 worth of product in 10 days in a pretty competitive niche, and that product that you revealed was a French Press coffer maker, right? Steve: Just curious, first of all why did you select a French Press which is pretty darn competitive in the first place? Manuel: It is, yeah. I saw it in the exhibition at the Canton Fair in October 2015. I’m an avid coffee lover; I drink a lot of coffee every day. I have a proper coffee machine with the capsule machine you call it. I always loved the idea of the French Press, because I think it really looks stylish. I saw that line, and I saw it had a copper finishing. I really liked the finish, and I thought, can I actually go into that niche because I know it is very competitive. It’s a very competitive product. I looked it up online, and there you go, there was no one with a copper version except the original brand Bodum. Their sales were very low, the price was very high. I thought, yeah actually that is a product that I could go for, because I have an advantage over those guys in terms of pricing. The look was also different in that one. I was the only other seller for this product. Of course there are right now I think over 60 different designs on the French press on the market. I’m still doing okay now. Right now I’m not doing any promotions, because I’m waiting for my third re-order to come in. I’m almost running out of stock again for the second time. I looked it up in Amazon, I saw there’s only 1 other seller which is Bodum. The design still looked different, and I went for it because I also had … Like I said I love coffee, and when I feel good about a product even if the competition is good. If I feel I can bring something good for this product and bring this over also in my listing, that my product is really superior, I go for it. I don’t even think too much about it, over analyzing, just go for it. Steve: How large was your first order? Manuel: 1008 pieces, product $4.53 including shipping, and testing and everything was about $8, $8000 investment. Manuel: $29.90, I make between $14 to $16. Now that I’m shipping by sea the larger quantity, I actually make $18 profit. Steve: Can we talk a little bit about the negotiation process. What did the vendor, first of all how many vendors did you approach, and what was the initial bid, how did you negotiate them down? Manuel: I approached a total about 10 suppliers. 4 of my own suppliers that I know have similar products, and the rest I actually found on Alibaba and Global sources. In the course I also wanted to show that I don’t just go to my own suppliers, but I also source on those sites. Steve: Just curious, how many of those that passed the initial screen came from Global Sources versus Alibaba versus your own supplier? Manuel: My own supplier which was the one I actually placed the order with. Then I had 2 from Alibaba and 1 from Global sources. Global sources didn’t have that many listings on suppliers on that product. Steve: I think Peter is telling me that Global Sources is really good for electronics, is that accurate? Manuel: Correct, also their exhibitions in Asia, they heavily focus on electronics actually. Steve: Okay that was probably part of the reason why it was harder to find a French Press on that platform. Manuel: Probably, but the one that I got on Global sources, if I remember correctly the response was very good. They were also very professional, immediately sending me a copy of certificates, and eager to do business with me from the start. The next thing I did, you really need to compare apple with apples. I checked is the material the same for all products? Is the outlook the same, and eventually you order sample. I didn’t really negotiate the prices right away. I filtered down to 3 suppliers who really had a good response. There was 1 Alibaba supplier, 1 Global Sources, and my own supplier that I met at the exhibition that were in the run. Yeah, I approached all three of them, all different samples. And prices were pretty similar on all three, but I just had the best feeling with the guy that I actually met at the show, because I met him personally. Steve: Right, yes of course okay. Manuel: If I wouldn’t have met this guy, I probably would have gone either with Alibaba or Global Sources supplier, because they both had a very good background. They had very high factory standards, one actually had BSCI standard which is the business social consumer initiative, which means the factory has a very high labor standard. People have access to fresh water; the factory is checked if there was no child labor. They are treated fairly; they get paid overtime and so on. Steve: Can we talk about that a little bit, like where can you check all these things? Manuel: Well, I guess you could look it up on my blog, or up in my book where I talk about the most common certifications and factory standards. For example BSCI is one of the highest factory standards. I mean if a factory tells you oh we have ISO 9001, I mean that’s nothing. Nearly every factory has that and it’s just to say that they work according to structured process. Steve: I would imagine the minimum order quantities would be a lot higher for those factories too though, right? Manuel: That’s true for example one of the factories had BSCI, they wanted a 5000 MOQ. And I only wanted to start out with a thousand pieces that maximum. And I mean that factory that I didn’t go with that had BCSI was actually cheaper than the one that I went with. But because of the MOQ was non-negotiable, I went with the other one. Otherwise I would have probably gone with the BSCI audited factory. Steve: So you didn’t change anything about this product right, you kind of bought it as is, is that accurate? Manuel: That’s correct. Well I added three extra fuel gauze. I did change the screw on the handle to make it also copper look, because it was a plain metal look. But other than that I just took it is, as it was. Steve: I’m just wondering like why they wouldn’t bulge on the minimum order quantities if it was already an item that they kind of produced? Manuel: Because I asked for FDA certificate. I asked for both silicates heat resistant class. And the standard product only comes with — the standard for a thousand pieces on that big factory only comes with regular class and no FDA certificate. Steve: Okay I see, so you didn’t modify it? Manuel: I guess so you could say, yeah. Steve: Right to the point where it’s not one of their standard products? Manuel: Yeah, but I didn’t change the outlook or anything. I just said I want a higher quality material, and yeah I guess in that way I changed it a bit. Steve: Okay, and then so you sourced 1000 pieces, and you probably got an inspection and everything and you got everything sent in. Given that it’s a very competitive product, can you kind of talk about your product launch a little bit? Manuel: Sure. I had different stages of product launch. The first one was obviously friends and family open Facebook review groups. And then I also launched through my email customer list, so I had a large list of customers that I collected over the years. Steve: Customers for which products? Manuel: Pretty much everything. And actually through the customer email list, I didn’t do so much sale. The really big sale came from my blogger list. I would talk about another thing that I did on the launch, but my own tools. I went through yeah the Facebook review groups, my customer emails, and I reached out to bloggers. Manuel: Just from that blogger. So in the second week I used paid tools. One of them was ZonBlast. I also Review Kick, back then it was free. Review Kick went well also their reviews were good, but what really — yeah sorry. Steve: I was just going to say so for those services did you get them away for free, or heavily discounted? Manuel: You mean the product price, right? Manuel: I gave them away heavily discounted like $1, so instead 3.99 most of them I’d give away for $1. Steve: So those reviews ended up being non-verified reviews, right? Manuel: Yeah, but I mean some of them are still there, but some of them have been removed from my listing. And then yeah I used ZonBlast, which was a big giveaway and also heavily discounted, and that pretty much put me on page– well for my main keyword on page one pretty first. Steve: How many did you have to giveaway to get on page one? Manuel: I think it’s all like giveaway up till today about 120 pieces, so more than 10% of my product — of my inventory. Steve: Okay, that’s actually not a whole lot given– I’m just thinking coffee press. Were you targeting like copper coffee prices or? Manuel: My main keyword that I targeted was French — no wait. French press coffee maker. But the biggest keyword would be French press, which is like three million searches and French press coffee makers like 150,000 searches. So for the main keyword I only got to take page 2 actually, and just briefly I think on page one. But what really– because I didn’t giveaway so much, what really helped a lot was the blogger, and my email list of course and yeah the Facebook groups. And all that together was really, yeah it was really helpful. I also used [inaudible 00:41:38] in week four which put me — left me on the page — on page two of the main keyword. And my main keyword was still on page one. And that also helped a lot. Steve: So I’m curious how did that blogger link to your Amazon product, was it just a direct link, did you do anything special with the URL? Because I know a bunch of people have been doing certain things that kind of encourage Amazon to rank your product with a certain keyword? Manuel: I hadn’t done anything like that for the bloggers. I just actually asked him also to give him — sorry to give him an incentive. I asked them if they were not already as an Amazon affiliate. I asked him to sign up as an Amazon affiliate, and you can get the link from Amazon, and then you just post it in your blog post. I didn’t really ask him to do any targeting keywords or anything like that; I just told him you can make additional money by being an Amazon affiliate. So he only used an Amazon affiliate link. Steve: Okay, I’m just wondering if that actually had a bigger impact on the ranking of your product, because you were driving outside traffic to your Amazon listing which was resulting in sales. Manuel: Looking back it would have probably been smarter to have not a super URL, but some sort of keyword link yeah, it would have been better. Steve: Oh no, I was just curios if that actually contributed more. Because like the ZonBlast and all those things it was obvious even though those reviews were not verified that they had a tremendous impact like the ZonBlast part? Manuel: I think so, it makes sense to have the keyword targeted yeah, I think it would have made sense. Steve: Okay and did those rankings last? I mean are you still on the front page for those keywords? Manuel: No, actually I sold out middle of May, because in the last few weeks before I sold out I was like doing 25 to 50 units a day. So I didn’t expect that, and I pre-ordered way too late, I was waiting for more results. And yeah I sold out in middle of May, and kind of now I’m back. And then I came in with another 200 pieces at the end of May. So I’m trying to keep inventory for now until prime day and until my stock comes back in, so right now my ranking is really bad to be honest. But I’m doing a few more giveaways when the big stock comes in, and I should be able to climb up again. Steve: So are you doing a much larger order in time for the holidays, like what’s your next order size going to be? Manuel: One is at sea now, it’s 2,500 pieces. And I’ll see how fast, let’s say 500 pieces go, and then I’ll probably do another order with 4000 pieces also by sea, and pretty fast probably, so yeah larger re-orders. Steve: And then when you are sending stuff by sea over directly to Amazon, are you using anyone to help you with any process? Manuel: Yes, well I use forward to that, I have been using for many years now. I kind of trained her the whole Amazon process. Like I’m doing the laboring in the factory myself, then she picks it up from the factory, she palletizes it. She puts the pallet labels on it. She handles the entire customs process in China, and in the US. She calls or their agent in the US, they call Amazon to make an appointment, and she delivers right to Amazon. Steve: Okay, so you had someone that you’ve worked with for a long time cover all this for you? Steve: And in terms of your defect percentage, do you have an idea of what that looks like? Manuel: It was about 1%, but throughout to 14 pieces I think since I have launched. So pretty low, actually the Amazon defect rate is pretty low. I mean a normal rate for retail would be 5%, but Amazon is 1% is pretty ridiculous actually. I’m happy with my 1%. Steve: Cool, and then after this you are in the process of launching a bunch of other different products as well, right? Manuel: Yes, well I’ve been working on Amazon for a while now, but this was my very first product on the Mandarin Gear. I worked with my partner; he has his Amazon account with green products. Through him and I was just the back office guy for him. And now that I have launched through my own Amazon account, the public product, I have been in the process of launching six new products. Two already launched, and three more coming in the next few weeks. Steve: Do you know anything about like Amazon presence over in Asia, like is there a presence over there? Manuel: You mean in terms of a market place, or people working? Steve: Yeah market places in Asia as opposed to — I mean you are concentrating in the US right now. But I was just curios what it’s like around where you live? Manuel: Amazon is not really present here, I mean they are in India, but it’s very small. I mean yes of course they are in Japan, but it’s very difficult to handle Japan orders. I mean if you don’t have the product that doesn’t fit the Japanese market, it’s difficult. And also the import procedures are a lot more difficult. You need translating for the listing and everything. And you need Japanese customs support. So if you don’t have someone who is helping, you it’s very complicated. As for China, they are not in china right now, but they are working a lot to help Chinese factories to go into the US or other companies. But we had other sites here that are predominant like Zalora and Lazada for example. Steve: And are you taking advantage of those marketplaces, or are you just focusing on the US market in the beginning? Manuel: For me its US market only, because I guess it’s very easy for me to deal with the US market also with the Hong Kong Company. And I have so many other different projects like kick starter and my sourcing company, the [inaudible 00:47:47] platform and courses, so yeah I’m trying to scale right now, but I will– the thing is to focus on Amazon US. Steve: Okay, well cool hey Manuel it was great talking to you today. If anyone out there wants to find you online or access any of your awesome resources that you mentioned, where can they find you? Manuel: Just look up importdojo.com. You can sign up for the newsletter, you will also get the free eBook, and the mail and my company details on the website, and yeah everyone please feel free to reach out, I would be happy to answer questions. Steve: Awesome Manuel. Well hey thanks for coming on the show, I really appreciate it. Manuel: Thanks for having me Steve, thanks a lot. Manuel: Hope you enjoyed that episode. Manuel is an expert when it comes to importing and he’s actually helped me find some vendors as well for our linen store. For more information about this episode, go to mywifequitherjob.com/episode130, and if you enjoyed this episode please go to iTunes and leave me a review. It is by far the best way to support the show and please tell your friends and share this episode. And if you are interested in starting your own online business, be sure to sign up for my free 6 day mini-course where I show you how my wife and I managed to make over 100K in profit in our first year of business. So go to mywifequitherjob.com for more information, signup right there on the front page, and I’ll send you the course via email immediately, thanks for listening. Thanks a lot Steve for the Podcast as well as the Transcript! Must admit, this was hugely informative and was worth spending 48 minutes spending behind it and reflecting on it later on. As a buyer, the question of finding dependable suppliers as well as sourcing products within Asia was really a big obstacle that I was coming across on most occasions. Was really glad to have found this guide as till now, majority of these sort of posts that I have come across were not sufficiently explanatory. All in all, it’s as if you read my mind and covered exactly those topics of which I was desperately seeking of. Especially the foremost fact of constantly carrying out a review, always followed by carrying out an in-depth background investigation on the supplier importantly by not merely counting on e.g. Alibaba commodities supplier or background examined. I was too casual in looking any further whenever I found out that the background was inspected by Alibaba. This tip for instance was really an eye-opener for me and there are many more. Again, thanks a lot for sharing this discussion with Manuel which is truly of great significance. Learnt a lot out of it.